"While in the clinic, I discovered I had problems with concentration, motivation, attitude, and temper. I have found a new way of life through the clinic's program and a 12-step recovery plan"
"In the past I've tended to overreact. I was sure I'd be a superstar by the time I was 21. Baseball messed up my plan of life. When I fail I get upset. Sometimes I get upset too quickly, without thinking of consequences." "RBIs win games; and they can make you a ton of money." "If I had to do it again, from Day One of childhood, I wouldn't change a thing." "It's going to be tough. I'm not really considered a media darling." "I feel like myself and the city of Cleveland are in the same boat. We're made for each other. 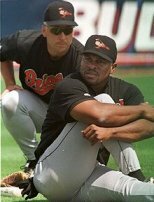 A few years ago, everybody had bad thoughts on Albert Belle. I feel that has changed." "As soon as he closes the door, we hear a bombardment of egg shells on my door. So I come outside and chase them. As soon as I caught up with him, I slammed on the breaks and was jumping out of the car and was going to run after him. It was raining and it was kind of mucky back there. The truck kind of skidded , or whatever, and it slid and bumped him. He fell down and as soon as he fell down, he jumped back up and started running. I feel like I was targeted. It's a shame where people target athletes. If they would have done the same thing to my next door neighbor and had my neighbor chased them, they wouldn't have filed a report. I made a decision five years ago to live in a community and be involved in the community, and I never expected people to harass me." 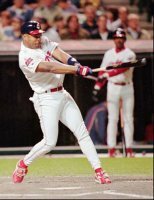 "I am concerned there is a lot of negative publicity about Albert Belle, and a lot of positive things I do haven't been brought to the surface. Maybe it's my fault for not being accessible to the media. So I guess I'm going to work on changing my image." "Look at Dennis Rodman. He was a bad guy until Michael Jordan said he was OK Now everybody says he's OK"
"It has its advantages. People stay away from you. I have a tendency to keep people at a distance. That's my personality. Only a few people are really friends. A lot of time I really don't trust people. Because of what happened in the past, I don't trust a lot of people. I keep my guard up"
"That's one situation you don't want to get caught up in. I've never been an egomaniac type person. This is a situation where I want to be paid my fair market value." "It was controversial because everyone just wants to dwell on my negatives. You'd have thought I was an ax murderer." "The Indians wanted me to issue a statement of regret when the fine was announced. But I told them to take it out. I apologize for nothing." "Some people are saying it's a slap in the face for me to go to a competitor, but it also was a slap in my face that they would go out and trade for Matt Williams, espicially when my sitauation was unsure." "What we should have done is kept the same team that played in the '95 World Series. Those trades caused a lot of chaos in the organization. I didn't feel like we were moving in the right direction." "I said, 'How about five years, $45 million?' But they felt like that was asking for too much. I just told them I thought they were making a big mistake." 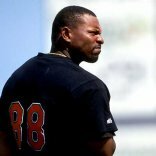 "Back in 1987 when they drafted me (in the second round), the Indians were the only team interested in taking a chance on Albert Belle, and I made the most of it. Hopefully, they got as much from me as I got from them." "Going to a new team is like going to a new high school. Nobody knows you. It's a chance to rebuild your image." "When you talk about locker room betting, we bet on everything....It's no different than anyone else's office pool. Money changes hands in the locker room; it's whatever you want." "The Indians didn't help me in dealing with the media. I think they wanted to keep my market value down. I'm moody. I know that. I've made some mistakes. But if I was a bad person, would someone want to pay me $55 million, would I have a scholarship fund my mother runs that pays for kids to go to school?" "Leaving wasn't a personal thing where I intentionally wanted to stick it to management or anyone. This is business. I felt I should have been rewarded for helping the Indians turn around a half century of losing. It was a shame they decided to treat me that way, after all I did for them. I helped this team go from 106 losses to basically 106 wins and into the World Series. And what do I get for it? Nothing." "I know the Chicago media will write a lot of bad things, but they'll write a lot of good things too. I can live with that. In Cleveland, all I got was negative press." "Wins. That's what's important to me. If you're talking about personal stuff, it's definitely RBIs. The most impressive statistic to me is having an RBI per game. Jeff Bagwell did that. I almost did it the same year, and last year I was only 10 off the mark. I know Hank Greenberg once had 100 RBI at the All-Star break in the 1930s. When I found out about that, it was like : "Whoa, 100 RBI at the break! You gotta be kiddin' me!" That's what I'd like to do. Hitting for a high average is nice. so is hitting a ton of homers. But driving in a run a game is awesome. My overall goal, though, is to be as consistent as possible, to play 150 to 160 games a year, get 600 at-bats, hit .300, hit 30 to 40 homers and drive in 130 runs." "I have high expectations for myself. I'm not out there playing the game just to be playing it...I want to win a championship." "It's expected they're going to show their ignorance. They've been in that situation before, when Art Modell moved his team to Baltimore. They were ignorant about that. They're ignorant about me leaving and going to Chicago. It's typical." "I'd rather just sit and shoot the breeze with the guys. I'll save myself the hassle. Then I don't have to deal with the village idiots for a few innings." "If Hargrove was his own man, I would have been picked. He is another person who doesn't appreciate what I did for him." "People want me to do things, be a certain way and that's not going to happen. I'm going to be Albert Belle." "I do 99 things great, then one incident happens and everybody blows it out of proportion." "How many (broken-up double plays) have happened since then? They didn't get suspended. Nobody says a word. They congratulate the guy for breaking up the double play." 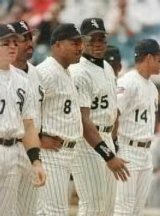 "People don't need to know what Albert Belle is thinking. I've learned from my mistakes in the past, and that's what's made me a better person." "It's an individual sport, so it's the exact opposite of baseball. If you hit a bad shot, you can't say, 'Well, this happened.' It's just you. It's your shot. You can't point the finger at anybody but yourself." "Moral values have been thrown out the window. Christianity is out the window. And that's wrong. Parents should be at home, teaching kids right from wrong, making sure they get a great education so they can be a success in life." "I think a lot of people are aware of the things I do. . .but maybe because of who I am, they don't want to report the good things about Albert Belle." "There were a lot of times in the Cleveland and Chicago organizations when I did something, they wanted to make sure the camera was there. I really didn't want that. This isn't something my parents told me to do. Or something my family told me to do. Or do things for publicity. I do this on my own. I do this from my heart." "I feel education is more important even now for the younger generation, than when I was younger. The kids really need to buckle down and get a good education. That's why it's so important to have computer programs and good tutoring programs, so they can have fun in school. It also keeps them out of trouble." "That's one record I've never thought about. That's one streak I don't think he has to worry about anybody breaking. I'm pretty sure I'll play until we clinch or if I'd get suspended. Those are the only two reasons not to play." "I would rather have come to Baltimore than the Yankees. You look at their situation, they're the kingpin and you want to be that underdog that knocks them off the top. That's pretty much the situation I've been in my whole career. It just makes for a better season when you knock the big guys off the top." "I was surprised when Cal ended the streak last year. It was fun while it lasted. I remember the excitement of seeing him break the record a few years ago when I was in Chicago." - February 25, 1999, On Cal Ripken Jr.
"That's one record he doesn't ever have to worry about being broken. It's hard to imagine. Day games after night games are tough, going to the West Coast with no off day is even tougher. Even when you're going good, it's tough to go out there, mentally." "I've been treated there just like everywhere else: you got everyone booing for you. I take that as a compliment." "I've said all along that I'll put forth the effort to work with the media. Spring training is a lot easier to talk to everyone. Once the season starts, I won't be accessible every day, but I've become more and more accessible every year compared to the past, when I just cut everybody off. It's been a gradual improvement and we'll just go from there." "I'm done with you guys." "If I waived my no trade clause I'd get up here and tell you. The trade rumors are false. I'm not going anywhere." "I'm not going to get a hit every time in clutch situations, but over the course of the season I'll get a lot of clutch hits. I'm disappointed it's come to a time when they boo me, And then to turn around and have the nerve to cheer for you, that's the way baseball goes." "That's why I put the sign up in my locker - 4 1/2 more years. I Know it's hard for some of you reporters to comprehend that and read between the lines, but I tried to do it pretty simple." "I'm pretty much right on schedule. Start off slow, finish up strong. I don't know why everyone panics. I've been doing this for 10 years now. Why change?" "I look back over my career and I almost pissed it away. I got a second chance and I've made the most of my opportunity. I play every game like it's the last game of my career." "A lot of people don't remember that Hargrove was my first manager in professional baseball. We go way back to 1987 in Kinston, N.C., in the Carolina League. We were together for a while until I left Cleveland." "The way I figure is we win as a team and we lose as a team, but I've got to figure out some way where I can have a better April and help the team get off to a better start. I normally heat up when it gets warm, but it would be nice to come out of April and everybody is chasing you." "I'm the kind of person that as long as you respect me and don't distract me before the game, then I'll respect you in return and accommodate you after the game. Sometimes the situation dictates that I talk, but everybody should understand I'm not going to talk every day, whether we're in first place or last place." "People tried to test me and I came up with some pretty good throws. Everybody on the team calls me 'Bazooka' now. That's kind of like a nickname I gave myself." "I mean, people think I'm too intense for baseball. I've always excelled to be the best, no matter what, but it's like people think something is wrong with that." "We need to start acting like a team, focus on winning and not worry about all of the other stuff that goes on. We lost our focus last year. We worried about who was being hired, who was being fired. That's got to change. We don't need any more finger pointing. We need to act like a team." "In baseball, I don't fraternize with players when it's time to hit. I'm preparing for the game. It's the most important time of the day. And I know if I don't hit, I won't have a job in the big leagues. That's why I tend to get very upset when people try to talk to me." "I notice a lot of hitters fraternize with pitchers. I see guys laughing and giggling before the game. These are the same pitchers who are trying to beat them. . . . I've never seen Roger Clemens talking to hitters before the game. Bob Gibson was the same way. Man, I don't even see Maddux playing golf with hitters." "The reason I left Cleveland is because I didn't have fun anymore. We had a great team in '95, and I thought we had a chance for a dynasty, but we fooled with the chemistry, and it blew up." "Now, look what's happened to them. They fire Mike Hargrove. That's John Hart for you. That's the way he has always been. He won't blame himself. He just points fingers at everyone else. He's never pulled the trigger on a big trade, and probably never will. I mean, you look at that team. They've been looking for a front-line starter since I was there. And now they sign a 37-year-old pitcher (Chuck Finley). That's why it would be a miracle if Manny (Ramirez) signs there. John Hart won't put forth the effort." "There were so many Cuban-Americans upset that we were going to Cuba and I was curious to see why they were so angry, and anti-Castro. I found out as soon as we got there. The people were treated terrible. The conditions were terrible. I can see why people risk their lives and limbs to get out. (Fidel Castro) lives like a king and won't help anybody, and has everybody scared to death. Nobody lives a normal life. It was still a good experience, but I thought we should just play that one game." "That was a disaster. We never should have played. That's why I was so upset. One game is fine. It was fun. You got all your questions answered. But the second game was mentally draining. So that's why I just stood at the plate. I didn't want to be there. It was cold and rainy. The field was wet. I thought to myself, 'Great, just how I want to spend my off-day.' "
"I hit much better when it's warmer. And Comiskey (Park) played a lot smaller in '98 than in '97. The ball carried a lot better. But in Baltimore, we had that cold and the wind blowing in. And I was getting pitched around a lot, too. That's why Ripken and Baines had such good years. The thing that would help is if they did something about that backdrop. They need to paint it darker. It's tough to see some of those pitches. I might mention something." "I have never received prestigious accolades, been acclaimed as a hard worker, winner, or team player, and have received unwarranted treatment that only Jackie Robinson, Curt Flood, and Hank Aaron could have experienced." "Baseball has been good, and I've been blessed. . .Even before this, I've always appreciated everything. I tried to play every game like it was my last. I hope I still have some games left, but if not, I've had a pretty good career." "I think everybody knows that when I'm healthy, I go out there and play hard. I've played in pain and I know my threshold of pain. But when your leg gets numb, you can't do anything." "Some are surprised I'm still out there. . .There's a noticeable limp in everything I do. They're surprised I've come back. Hopefully, I can be full of surprises. But to get anywhere near where I need to be, I need a miracle. I'm going to give it all I've got until the last possible day." "Baseball's a team sport. In order for me to be successful the other guys on the team have to be successful. So, if you're gonna acknowledge me, you have to acknowledge all the guys I've played with. You know, if it wasn't for them, to put me in a situation where I have a chance to produce, I wouldn't be able to produce." "(Getting in) is not going to make or break me. . .What I set for my goal in life when I started professional baseball was to take care of my family. Once I did that, it was to win a championship." "I was too scared to take (steroids). . .I was into fitness and concerned about side effects and how it would affect me later in life." "I never used a corked bat. . .And if I took it to court I'd win that case." "I guess what a lot of people don't realize is that when you put that uniform on, it's a different world. . .A lot of people take advantage of you. From a personal and business standpoint, it's a dog-eat-dog world, and I wasn't afraid to tell people 'no.' "
"Looking back at it, I wish I used the media more to my advantage. I was never concerned about the endorsement dollar, but it did affect my relationship with fans." "It's a great honor to be inducted and to be recognized for the achievements I've made and representing the state of Louisiana. I was kind of surprised that it came about. It's a great accomplishment." "Probably when I played Little League, when I was playing in Bossier City. I think my first year, when I was 11, we went 14-2 and the next year we went 16-0. I kind of knew then, deep down I really wanted to play baseball. But it's kind of a dream back then and you didn't really think it was actually going to happen." "When you have a chance to work with some great players around you and a great organization, you have a chance to do great things. I was fortunate enough to have some great players around me and I was able to put up some pretty big numbers. You really didn't focus on the individual things." "I don't think people realize that being a professional athlete, you're constantly bombarded at all angles. You really have to be protective of yourself because there are a lot of people who will take advantage of you. I was very guarded and very protective of myself. It's unfortunate you have to be like that, because there are people out there who will take advantage of you. It's just the way our society has come. There's a lot of athletes, including myself, who have done some great things for the communities around America but they just haven't gotten recognized because maybe something negative happened that overshadowed it. You can do 99 great things and if you do one bad thing, the one bad thing outweighs the other 99." "When I left Chicago to go to Baltimore, it was a culture shock. I thought I was a perfect fit for Chicago and, now that I look back at it, I wish I had stayed in Chicago to see if we could put together a championship team." "Bertman was a great coach, who taught us fundamentals, fundamentals and more fundamentals"
"Even Jesus Christ got angry at times, and He was perfect. Try as I might, I'm not perfect. I have to work on my shortcomings." "I was a player. I had to concentrate on what I was being paid to do, improving my skills, with little time for chitchat with sports writers. I don't think people realize that being a professional athlete, you're constantly bombarded at all angles. You really have to be protective of yourself because there are a lot of people who will take advantage of you. I was very guarded and very protective of myself." "I'll always be a baseball player at heart because I loved the sacrifice fly and the stolen base just as much as I loved the homers and the RBIs." "It's great to be recognized now that my career is over for the the individual stats you put up. You have to realize that I had some great players around me that pushed me to become better. We all pushed each other to play better and we were all successful. . . It's kind of fun to enjoy the individual accomplishments, but it's truly a team spot. I'm just happy I had a chance to play with some great guys."